Driven by the question what the heck three different leavening agents are doing in this recipe. I think between the Babes we should be able to come up with an explanation. The first time I baked this particular recipe was a long-distance bake-together with my sis on a Sunday morning. She found the recipe on a blog, I googled a bit and found that it was remarkably similar to the Pioneer Woman recipe. I was surprised by the lightness of these rolls and intrigued by the recipe ingredients. So that's the thing behind the recipe. Then, there's wacky. Wacky because of the above but also.... Let's try to make it different. Let's NOT use cinnamon. Let's say cinnamon is verboten! So if you were tempted by a bialys recipe....make bialys rolls. Or make bacon and cheese rolls. Orange pudding rolls? Lemon curd? Pizza? The original recipe starts with heating milk/oil/sugar to just below a boil and let this cool. I never do that, didn't do it this time. Also, the recipe tells you to sprinkle on the yeast and let it sit for a minute to bloom. I never do that... didn't do it this time. Basically this recipe follows the rules for making rolls, as in: make the dough, bulk rise. Roll out in a rectangle, add filling of your choice, roll up from the long side and cut into slices. Proof and bake in a moderate oven. Now the difference lies in the leavening combo and that comes to show in the rising method. Room temperature milk, vegetable oil, sugar and yeast in a bowl. Add 4 cups of ap flour. Stir until combined, cover and let rise for 1 hour. Mine looked like this, sturdier than I expected but I couldn't bear to use all of that 120ml oil... I used 75. Next, remove the cover and add baking powder, baking soda, salt and the remaining 1.2 cup of flour. Stir thoroughly to combine. Below mine, ready for the fridge. Plan to leave it in for 1 hour or so. You may now proceed to roll out the dough in a rectangle or refrigerate for at least an hour or up to 3 days. (Probably need to keep an eye out for overflowing dough, so punch down if it rises to the top). Relatively slack dough so it definitely is easier to work with when chilled! Proceed as you will with any other rolls you make; roll dough into a large rectangle on a floured surface. Original states to roll thin, I rolled my usual thickness. Use whatever you feel comfortable with. Although I can imagine that a slacker dough might need to be rolled thinner? To make the filling, use your imagination... go sweet, go savory, go wacky but don't use cinnamon as your main flavor!!. Make it yours and make it good! Now you are probably ready to start rolling, I always start with the long side closest to me and roll away from my body. You could do it the other way round, I am easy like that! Just keep a tight roll. Once you have your roll, pinch the seam and roll it once over so the seam is on the bottom. Slice into 1.1/2 inch thick slices. Cover and set aside to rise for at least 20-45 minutes before baking. I would love for you to make the rolls your own. Surprise us with your imagination. What I also would like to know... why the leavening? Why not use just yeast, or only the other two? So yes, you need to use all three in this recipe, let's find out! Yeast is a living organism which produces Carbon dioxide and alcohol as it breaks down sugar. When the sugar has been exhausted, this action will stop. Also, if the temperature is high, the yeast will be killed. Some receipes [...] use the help of baking powder to supplement the leavening action. This way, you have the benefit of the yeast flavour (and whatever leavening the yeast achieved) and the leavening action of baking powder under baking temperature. Naturally, you don't want to use too much baking powder so as not to compromise the yeast flavour. Basically, yeast leavens the dough before baking, while baking powder leavens it during baking. And what did I do with the filling?? - My first batch was as is cinnamon rolls. - Second batch, filling pictured above, was cream cheese, lemon zest and juice and a bit of custard powder to thicken. Lots of ground vanilla as well.... They were very airy and light, creamy and bursting with flavor. However they stayed quite pale, maybe the cream cheese did that. I am your host this month. Bake these "Not-a-cinnamon-roll rolls" according to the recipe above and post it on your blog before the 30th of this month. Please make sure you mention BBB April 2016 in the subject line and link to this BBB post in your own blog post. If you don't have a blog do not hesitate to bake and email me at bakemyday at gmail dot com with your name, a 500px wide image of your bread and the link to your BBB post. 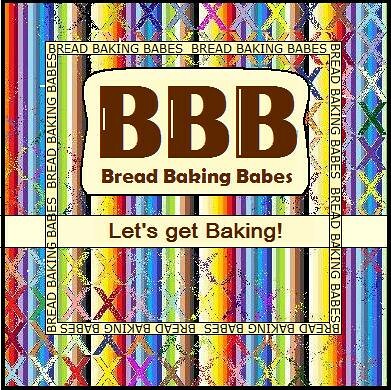 I will then send you a BBB badge for this bread that you can then add to your post on your blog. The round up can be expected around the 2nd of May. Well if it can't be cinnamon, that third option looks really appetizing!! Oh the onion, feta, tomato, walnut...and balsamic! What a stellar combination. This was a fun dough to try and it was great to try out fillings in my mind. Love your's, the lemon and the onion both. Both your rolls sound delicious! Thanks for a fun and creative theme, Karen! "balsamic vinegar syrup drizzled on top" Oh my heart be still, I almost used that. I will next time. I love all your fillings pale or otherwise but that balsamic vinegar syrup drizzled on top totally wins me over. I will bake these again, soon even me thinks. This was total fun and now we have another keeper! Thanks a bunch! Thanks for the challenge Karen! I love the idea of an un-cinnamon roll and using the 3 different raising agents was fun! Those savory rolls are making my mouth water! Two kinds of fillings!! They both sound wonderful but I really like the idea of the second savoury version. What a brilliant choice for this month. Thank you!! There is something about cinnamon swirl bread that never disappoints. This bread looks tender and delicious! There was a similar bread in the New York Times the other day. I’ll be trying this soon!